"Nancy just said she 'just doesn’t understand why?' Very simply, without a Wall it all doesn’t work. Our Country has a chance to greatly reduce Crime, Human Trafficking, Gangs and Drugs. Should have been done for decades. We will not Cave!" At her news conference, Pelosi doubled down on her refusal to negotiate a border security deal, saying talks will happen only when Republicans agree to open the government for two weeks, which they so far have refused to do. "We have asked them over and over again to take yes for an answer," she said. "We are firm in our support for how we secure our borders. Let's have that discussion after we open up government and let us get to work." 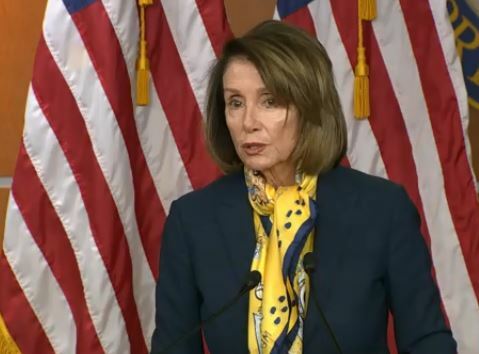 Asked why she doesn't hold another face-to-face meeting with Trump, Pelosi replied that the last such meeting a week ago was a "photo op" for Trump. "But they know full well that we are here, in order to have any conversations."